Photo of: East Coast of Ireland: Meath: Newgrange. 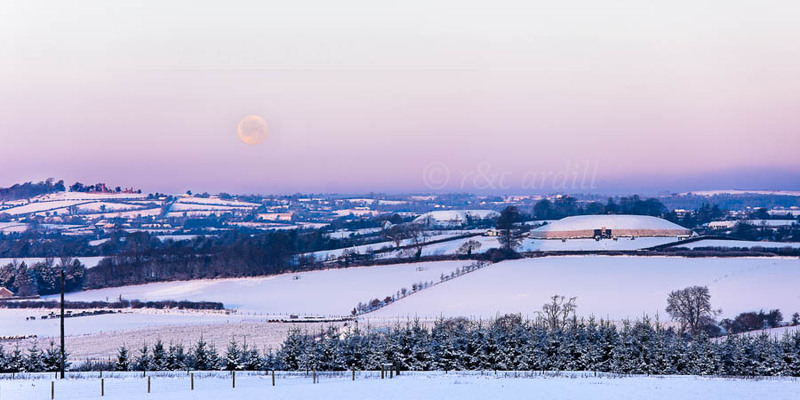 Winter Solstice on the 22nd December 2010 over the Boyne Valley. The huge Hunter's Moon is fading in the dawn sky. To the left of the picture the Hill of Slane with the ruins of Slane Monastery can be seen. To the right of the photograph is the Neolithic burial mound of Newgrange. Behind and to the left of Newgrange is the second largest passage tomb of Knowth. Some people can be seen at the entrance to the Newgrange tumulus: at this time of year the sun shines through the opening at the top of the entrance right through to the centre of the tomb. A few lucky people each year are chosen by lottery to witness this extraordinary event. The beautiful clear morning was perfect and the sun can be seen shining on the tomb's entrance.